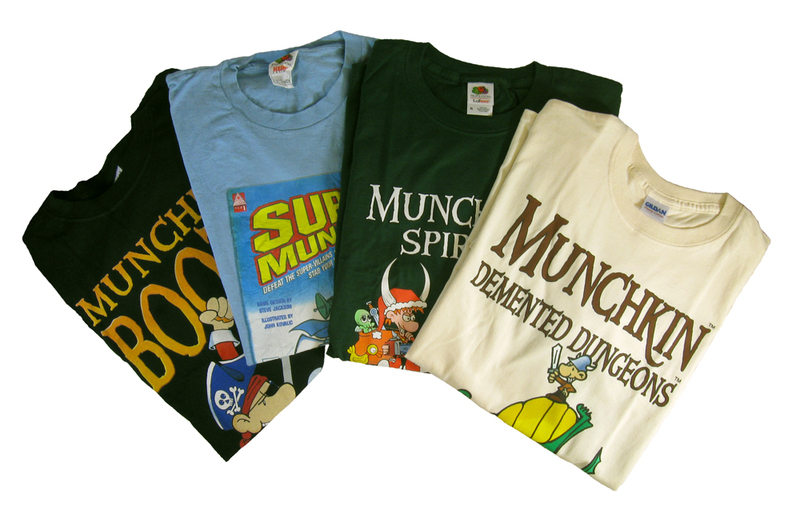 Daily Illuminator: Munchkin Shirts -- Wear One, Wear Four! April 2, 2011: Munchkin Shirts -- Wear One, Wear Four! That's right: Munchkin shirts are light enough to be worn under another one . . . or two . . . or three. Okay, wearing four shirts at once is going to get a bit warm. But that may be just what you need. It's a trick Northerners use to stay warm during winter -- multiple layers of light clothes, which keeps them warmer than a single layer of a heavier material. Yes, I'm talking to you, guy at PAX East, who was walking around in shorts, flip-flops, and a insulated coat. It was 30 degrees! What where you thinking? So layer the Dungeon Dementia shirt over the Momentous Unmasking shirt over the Utterly Unsinkable shirt over the Christmas Loot shirt. All these -- and more -- are available right now in a variety of sizes from Warehouse 23.